The Vancouver Condo Buzz » From Mid $400’s > New Westminster CANOE at Port Royal > Great offering of single family homes, triplexes, townhomes & row houses for sale! Coming September 2014! CANOE at Port Royal is a new collection of beautiful triplex, townhomes and single family homes in the master planned New Westminster real estate district by Aragon. Aragon is one of the leading boutique developers in the Lower Mainland, and a definite favourite of ours at the Vancouver Real Estate Buzz. High quality craftsmanship, detailed work and great customer service make for a unique and luxurious living experience for home buyers. The presale New Westminster CANOE at Port Royal homes will be the first phase that introduces a variety of home plans and floorplans (between 1,251 to 1,841 square feet) that fit many different lifestyles and families of all ages to singles. The VIP previews will be starting in Fall 2014 and you can now register your interest online at www.aragon.ca/Canoe. The collection of single family detached homes is a first at the Port Royal New Westminster community and this is complemented by attached residences in the form of townhouses and triplex buildings. Whatever you are looking for, the New Westminster CANOE by Aragon project is coming soon and will present one of the most exciting opportunities this Fall! The master planned neighbourhood of Port Royal by Aragon is over three acres with beautiful pathways, courtyards and parks that both separate as well as connect homes. The lush green spaces are great for relaxing and enjoying the clean crisp waterfront air too! The first phase release at the Port Royal CANOE New Westminster development includes both 2 and 3 bedroom row houses, single family detached homes, triplexes and attached townhomes, giving a wide variety of housing types for prospective home buyers. There is something for everyone, so stay tuned! More information is now online at www.aragon.ca or you can visit their Facebook, Twitter and Pinterest pages for more details and pictures today! The newest addition to the master planned Aragon New Westminster Port Royal community is CANOE! The three acre Port Royal Park development will feature a fine collection of both 2 and 3 bedroom townhomes, triplex units and single family houses. In addition, there are select row houses that line the streets here at the New Westminster CANOE at Port Royal neighbourhood that if finely finished with pathways, courtyards, and parks that both separate as well as connect the residences in this boutique community. Some of the incredible features at the Port Royal CANOE New Westminster townhouse and single family home development is that the buildings are constructed with brick and wood with a heritage traditional style that features distinctive gables, pitched roofing, shingles and chimneys. There are French doors that lead to outdoor patios in addition to cut outs above the front door, large skylights and oversized windows for maximum natural light. Inside the New Westminster CANOE at Port Royal homes will be engineered hardwood flooring throughout the main living areas, soft carpets on the second floor bedroom level and electric linear fireplace in the living room by Dimplex with rich custom paneling from South American wood. All of the homes come with GE Café front loading washer and dryer in addition to storage areas that are distributed throughout the floor plan that includes garage storage and crawl spaces in some layouts. There are quartz counters and large format tiled backsplashes (ceramic tile) in addition to a full size GE Café appliance set in the kitchen with a convection oven, warming tray, five burner gas stove with griddle and a stainless steel fridge/freezer. As well, the New Westminster CANOE at Port Royal homes will have eight foot high flat paneled kitchen cabinetry (that go to the ceiling) in addition to beautifully framed mirror on top of Kohler Purist bathroom sink and travertine inspired polished porcelain tiled floors. GRAND OPENING PREVIEWS at Canoe New Westminster on September 27th! Discover New Westminster’s Canoe at Port Royal, a collection of triplex, townhomes and single family homes built in this most diverse riverfront neighbourhood. The Canoe New Westminster residences range in size between 1,251 to 1,841 square feet and will start in the mid $400’s during this presales phase. Join them at the grand opening previews on Saturday, September 27th at NOON sharp for the public opening of Canoe! Four designer display suites to preview in homes that are truly unique and unlike anything on the market today. The sales centre will be situated at 260 Ewen Avenue New Westminster. From the email marketing desk: Thank you for registering to find out more about Aragon’s new community, Canoe at Port Royal homes. We are almost ready to open our doors to the public, but before that happens, we’d like to offer you exclusive access to this one of a kind community. As you may know, New Westminster Canoe homes for sale is located in Port Royal, and is part of a 52 acre master riverfront community, consisting of a wide variety of home styles from single family, triplex, row homes and town homes. The way we look at it, there’s something for everyone! 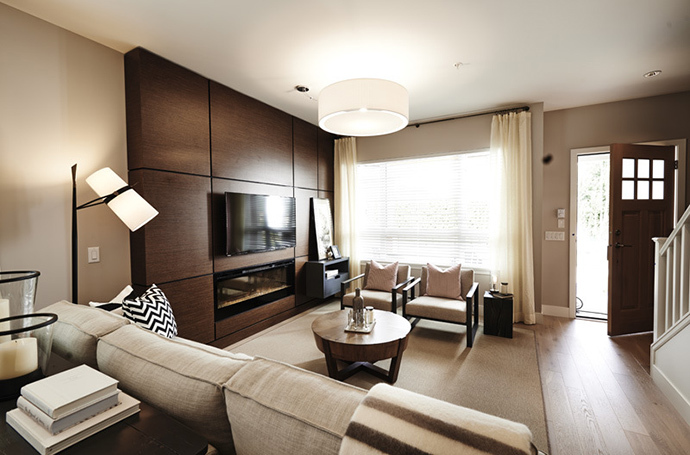 The Canoe New Westminster homes range in size from 2 bedroom, 1,250 square feet up to 4 bedroom, 1,800 square feet. Prices start in the mid $400’s.